Website started on 8th March 2013. The contents of each box is listed on the right, under ‘Recent Posts’. Clicking on any of these will take you to a list of papers, reviews and articles of some relevance to that area. Most of these references will have a hyperlink which will take you directly to that actual work, online. The final post, BIBLIOGRAPHY & LIST OF ALL REFERENCES, contains an alphabetical list of all the academic references in all the posts on this website. This is the most useful general resource post on this site. Click on HOME to return to this page, or go straight to MULTIVERSE. This is very much ‘work in progress’! I am a neophyte; it will contain many errors. It is a steep learning curve for me, and a genuine attempt to try to pull this area into a form with which I can grapple. It should not be seen as an attempt to be comprehensive, focused or wise. Comments can be made either on the comments template AT THE BOTTOM OF THIS POST and/or by email to: markteverson@sohoarts.co.uk. If your comments need to be changed after ‘Submit’ is clicked, please note that ‘Go back’ will not retrieve your submission, but just allows you to send another. Comments made on this template are only visible to myself via my personal email. They do not appear on this website. 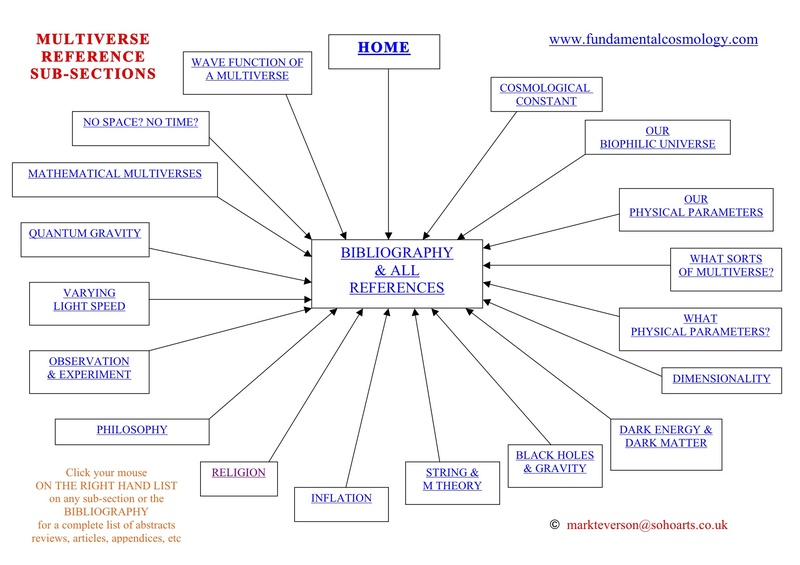 Historical – Hoyle, Everett’s postulate, Carter, Copernican principle, etc. 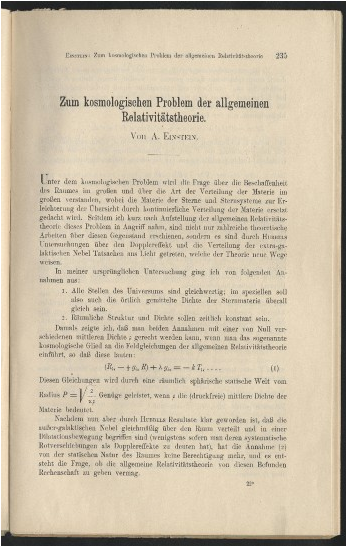 Lemaitre, Boltzmann, Dicke. 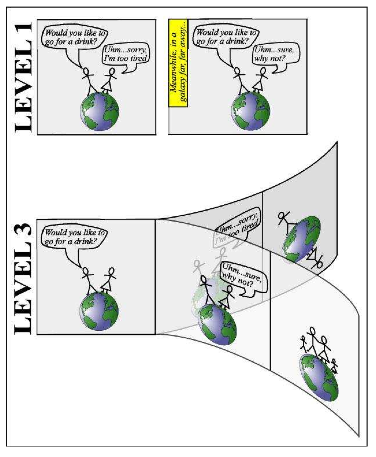 Maybe I’ll draw a Level 2 right hand pane which has an “earth” & “people” that have evolved from very different physics! My idea – Improve on Tegmark’s 4 levels. Extra universes can occur completely independently of others, whether others are there or not. Clearly therefore there is no time’s arrow correlation. If this is right, there should be 3 terms: Universe, Multiverse, Multi-universe. The multi-universe, or more correctly, the Multi-multiverse, is a kind of extension of the mathematical universe idea, ie. clearly a universe of no connection or knowledge to anything else. A fresh wave function. The idea is that it QUALIFIES THE MEANING of Tegmark’s Level 4. His Level 4 could be interpreted as a purely abstract, mathematical construct. I propose that it should be viewed as the whole multiverse over again, but with not even a quantum connection. Imagine it were created by a different God, one that had no idea there existed another God or Gods, and could never know of their existence. An infinity of Gods, all of whom thought they were the only one!! The question, “What happened before the Big Bang?” Well, a pub discussion answer is – “It just happened, out of nothing, no space no time”. My multi – multiverse is the same idea. If one multiverse “Just happens”, so can another. And another. The multiverse has a notional connection to a previously existing universe. A multi-multiverse would therefore not need any relation to being eg. another vacuum energy state. It just is. Philosophically, IF there exists one universe, ERGO why should there not be another? If one happens, so can another, but not ‘because’ of the first one ie. not as a result of it, but just that if one can be there, why not another? Make another box chart of this idea. The Universe is interconnected boxes, representing eg. different Hubble areas in the same multi – multiverse of multiverses. Totally unconnected to these boxes are other multi – multiverses, some mathematical, impossible to imagine they could exist, & others, possibly biophilic, but with no causal connection. Tegmark does not make obvious these points, though clearly that is what is intended. A clear revision of multiverse terms. Tegmark’s multiverse works are accessible and his levels a useful device. But his numerous works are messy and imprecise in places. 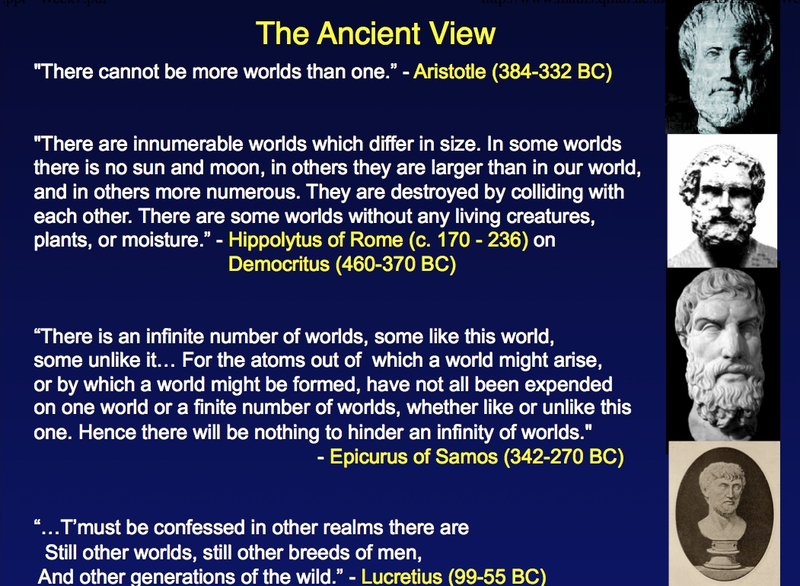 There is a need for a more succinct presentation of current thought on the multiverse. Parameters of physics – more detail. Cyclic universe. Ekpyrotic/Inflation – TUROK/STEINHARDT. An in-depth analysis of physical constants is necessary, in the values for speed of light, Planck’s constant, vacuum permittivity, mass of the electron and electric charge – with specific reference to the multiverse. The value for alpha is well documented, and is appropriate for this dissertation. cf. BARROW & many others. Further, some discussion on why is, say, gravity ‘Gravity’ and not ‘Mass’? (Higgs etc.). What actually makes one ‘Dimension’ different to another dimension? What actually happens as mass and energy become one another? There’s a whole library in there! I need to understand how constants such as c, h, e, G & vacuum permittivity (as dimension-less values) are constrained within the mathematics, and are such ‘constants’ expected to be constant only within our Hubble sphere viz a viz Tegmark’s Level 2. I am going to need some knowledge of GUT & string to discuss how such things could emerge dynamically. 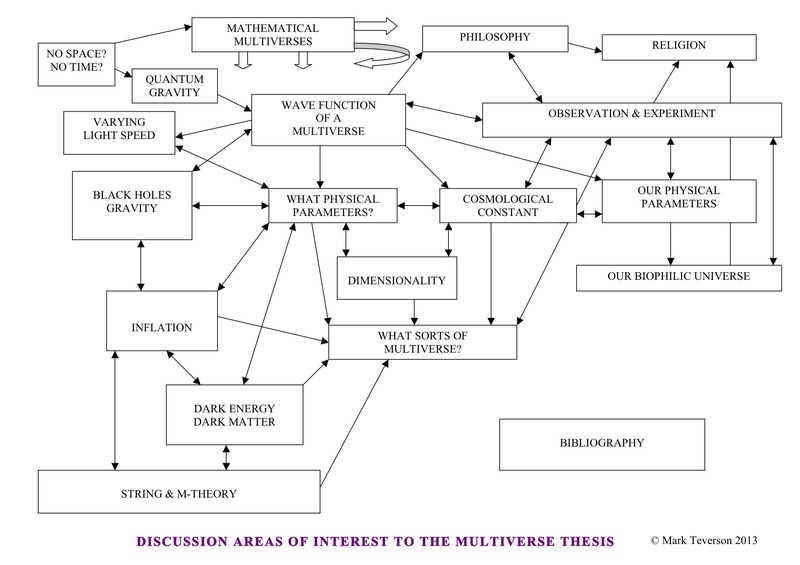 Implications/Philosophy of cosmology – so what? etc. What is meant by ‘physical’ reality? Cosmological constant problem – a personal thought – does Lamda only influence the body of the universe as an ‘anti-gravity’ or ‘repulsive force’ parameter, or could it have any other role? We do use the term ‘energy’ to describe it, after all. Another role may add another reason to the Turok et al explanation for its decay, and allow us to remain on the Big Bang concordance model. I haven’t studied the Turok/Steinhardt ekpyrotic model, but it sounds a neat way to discuss the cosmological constant problem and do away with the Big Bang – or at least, going back to the start of the last cycle. There’s still the first cycle to deal with. My first impressions, though, are it’s a fudge! 9am 21/6/2013 An introduction. Assuming a big bang, we have a massive unit. To stop it withdrawing back to a black hole singularity we need a massive repulsive ‘cosmological constant’, & hence expansion. So why does inflation initiate? So – was the universe born with the negative pressure? Lamda existed at the instant of big bang (otherwise it would never grow from the singularity)? And was then instrumental in inflation. Later, lamda controls how long the universe goes on.